Mixed trio, 8eight, returned to the music scene with a completely different concept for their title track ‘Validity Period’ going with a synthesized electro beat. Unfortunately, some Korean fans weren’t very fond of the change in the vocal group, so the group went back to the studio to make ‘The End Is Coming’, written by Bang Si Hyuk who also wrote their hit, Empty Heart for their mini album The Bridge. The album starts off with an intro ,사랑이 간다 / Love is Leaving, sounds of silverware clicking against plates lead in an heartfelt dialogue from Lee Hyun backed by a piano and orchestra. This leads into title track, 이별이 온다/The End Is Coming, a power ballad talking about love and pain. Baek Chan’s rap over Joo Hee’s and Lee Hyun’s harmonizing gives the song a little more edge while still remaining in the broken hearted state. 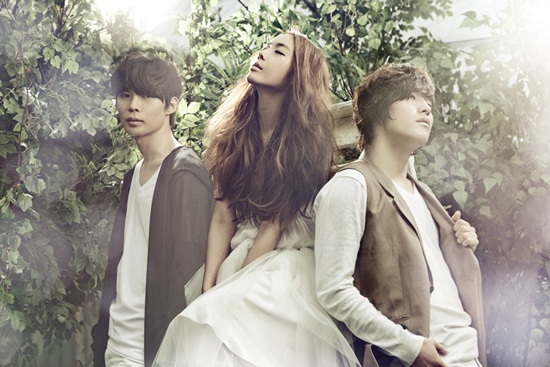 얼굴이 바껴도, another ballad with that showcases both Lee Hyun and Joo Hee’s vocal power. Baek Chan provides a short rap. This is a good song, but I think towards the end of the song the singers go from having power to screaming. I do love the piano outro; very nice melody. Next,STAR, featuring 2AM members Jin Woon and Changmin. That first burst of the introduction sounds alike to Wondergirls’ intro﻿ for ‘Wishing Upon a Star’﻿ from their very first album. Following is 유효기간/Term of Validity/Validity Period, an upbeat song with synth that strays away from their usual slow tempo songs. This is my favorite song because it’s something new from them and fun. The album ends with Outro : The Bridge. I liked the fact that 8eight tried to try something different, but apparently their other fans didn’t. I hope that their next single won’t be another ballad, but something fun and light hearted. I give this a 4/5 and recommend tracks: The End Is Coming, STAR, Term of Validity.